Greetings. 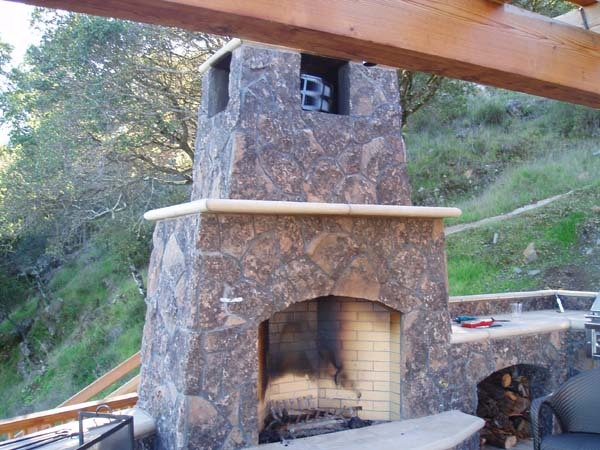 Enclosed are images of an installation in Kentfield, CA. The fireplace is having problems with smoke not dissipating, making for a very smoky fireside experience. We have replaced the spark arrestor with 1/2" mesh as a first measure to improve the draw. Do you see anything that may be causing the fireplace to smoke so? Any help would be appreciated. I'm sorry to hear that it smokes. It's a great looking fireplace. There are several things about the construction that you might improve. 1) The chimney is very short - little more than the top of the smoke chamber. How much trouble would it be to carry the flue liner up through the slab over the top of the chimney? Maybe even create a second level Pagoda style to the top. If you could temporarily slide the top slab aside and set another flue liner or two on top of the chimney you could see if it worked or not. As we say on our outdoor Rumford page at http://www.rumford.com/outdoor.html "Outdoor fireplaces may smoke in a breeze so shelter the fireplace from the wind and build the chimney as tall as you can." 2) The arched surround is dropped below the rounded Rumford throat without filling the pockets behind the arch. The throat is an airfoil and you have created a bug shield on the leading edge by not keeping the transition from the arch to the throat smooth and streamlined. Again, a little plaster to fill in the gap and feather it into the throat to keep it streamlined would be pretty easy to do. 3) I notice a hillside in the picture. Was it a windless day? If there was a breeze, was it coming down the hill? Outdoor fireplaces do tend to be temperamental in a breeze but maybe you can shelter it somehow. If there is a predominant wind down the hill you might try blocking the windward side of the chimney at the top to help block downdrafts. Maybe a little experimentation with several or all of these suggestions - cheapest and easiest first - would make the fireplace useful. Let me know.